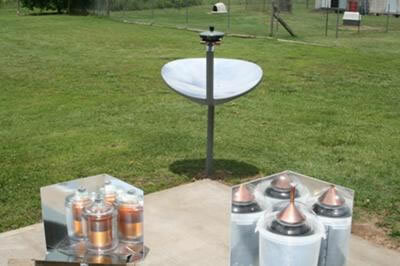 Old satellite dish and solar panel cookers. I found this old dish at the city recycle area and converted it to a cooker by first sanding it smooth and covering with 2" strips of reflective vinyl covering ordered from this site, Solar Cooker at Cantinawest. I then formed a copper plate and attached it to the receiver bracket in order to get even heat distribution for the pot/pan. The panel cookers are Solar Cooker at Cantinawest.com's reflective vinyl attached to plastic sheet material. Doing experiments with different liquids in the pictures but a black painted glass jar will cook pinto beans in 4-5 hours. Thank you very much for sharing your great looking solar cookers. And even a small parabolic at that. That is a great use for the reflecive vinyl. I was wondering what you would do with all of it. I really like how your panel cookers look, they have a distinctive appearance. I presume this is just some of a few more solar cookers that you may be building over time? 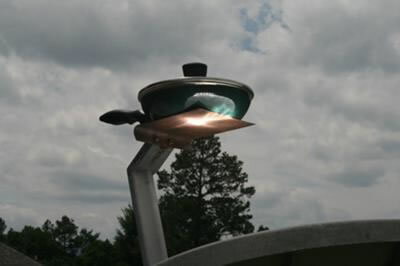 I hope this can inspire others to give homemeade solar cooker building a try as well. Comments for Old satellite dish and solar panel cookers. I really like the Reflective Vinyl and am now working on a larger square parabolic cooker, building it from scratch. Even the small parabolic in the picture produces alot of heat so I can't imagine yet what a 4' square parabolic is going to generate. Guess we will see! My neighbors are amazed at my success with the small cookers.